Iberia is currently selling return Business Class flights on BA from London Gatwick to Barcelona for just €182 (£160) return. You will be on a British Airways flight but with an Iberia flight number. You can book at this price for travel up to 19th March. You do NOT need to stay a Saturday night. It earns 80 tier points return so, at £2 per point, is good value for anyone looking to ensure they requalify or hit a new status level. And, of course, there are far worse places to go than Barcelona on a tier point run! Other Spanish cities are also bookable, but will generally cost between €200 and €250 return in Business Class. You need to book on iberia.com to get this price and you need to select the Gatwick service. You cannot book on ba.com even though you will be flying on BA. Don’t log in to book because you need to add your Executive Club number during the process. 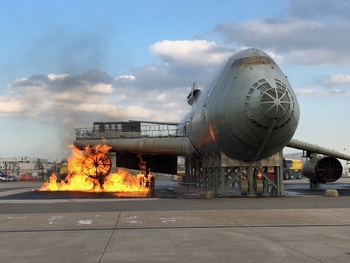 Airport fire fighter training in action! If you follow our Instagram feed you will know that I had a tour of Schiphol Airport in Amsterdam yesterday. I will do a separate article about the KLM-owned engine refurbishment business because I think you’ll find it interesting. However, I also wanted to share the short video below. I got to watch the airport fire brigade practicing on their training aircraft. As you can see below, it was impressive. Because Schiphol is so big, it needs to have three fire stations due to the requirement to be able to reach any part of the site within three minutes. There are 150 full time firefighters employed to provide 24/7 coverage across the sites. If you are reading this on mobile the video may not show. See it on YouTube here. The Civil Aviation Authority issued new instructions to UK airlines yesterday on how they should treat passengers with ‘hidden disabilities’, including the deaf and blind. If you want to know more, the full CAA guidance can be found here. Flew MXP-LHR yesterday (CE) and catering was supplied by Do&Co, easily the best cold plate I’ve had on an European flight. I thought the switch was to happen much later? Do&Co has picked up LHR CE since the recent change. I heard that it was a gradual shift between October and the end of the year. Maybe you just got lucky that your route was changing first. I have had only a couple club world trips so far, one to JFK and one to BKK. There was no comparison on the food, with JFK being far superior. I suspect/ had not realised that it was because JFK was Do&Co, but that makes perfect sense now. I am flying first to Houston in late November, first time in first, hoping the food will be another step up from the JFK flight. Also have a flight booked in CW to Cancun next year, but that is from LGW so not Do&Co. :-(. Couldn’t find any flights at that price ? All gone ? O/T: I’m very nearly at my £50k Curve annual limit. Has anyone had any success in accidentally ‘losing’ their Curve card and it then being replaced with a new one where you can start afresh on another £50k? Or is my only option to get a Curve card for my wife and getting a new allowance that way? How about upgrading to Black from Blue does that reset the spend? Losing doesn’t work. Been there, tried that. @Axel that doesn’t work either as I know someone who tried recently. Though full change from the “pre-paid” to debit did. Losing it worked for me, but not for Mrs Mc. I assume I was the anomaly, although I only tried it following a suggestion by someone in the comments section a few months ago, so I guess that is at least 2 successful resets. I am assuming the best (and possibly only option) in future is going to be to sign up to their new card when they launch next month, which will include a monthly/annual fee. If this fee is small enough, I will be looking to upgrade Mrs Mc immediately, and myself once my £50k limit is reached again. O/T: I’m having a mental blank and could do with your advice. I have to spend my 90000 Iberia points soon and am trying to work out the best way to get myself and the family to Malta. In an ideal world I will book the lot on Iberia but if there is split availability across iberia/Avios/ BA sites am I able to book flights in other family members names without being on the same booking. To complicate the issue further I have a Lloyd’s upgrade voucher which expires soon which I want to use as well. We are 2 adults, 2children and a baby. My brain hurts from thinking about this! I thought they all shared the same availability (in theory?). Also you would need to check if avios.com can use avios from your Iberia account or if you would have to move them to BA first (with the associated complications. Are you planning to have the 2 adults in CE and the kids in ET or are there plenty of CE redemption seats? The flights are for next years October half term so am not sure about how many CE seats will be released. Although I would love to put the kids in economy they are still a little too young. If it’s the same availability throughout Iberia/ba/Avios then that answers probably the main issue. I was thinking that I could book all of us outbound with Iberia ,myself with the baby and one child with Iberia and then the wife and one child back with the lloyds voucher. With the lloyds voucher do I have to be a one if the upgrades if it was from my account? You’ll have to be very fast to bag 4 CE seats for a half term holiday. You’re also further risking them being taken by someone else if you wait to call avios.com to use the Lloyds voucher. If you need to use the avios/vouchers for a particular date I would suggest having a couple of back up destinations in mind.